FUKUOKA/TOKYO, Japan: A probe into an assault by a sumo grand champion against a junior wrestler threatens to stain the image of Japan’s ancient national sport just as its popularity was recovering from previous scandals and a shrinking fan base. While some wrestlers say the harsh conditions that can breed violence in the closed, hierarchical sumo world have improved in the decade since a teenage wrestler was beaten to death, the new incident shows the path to reform remains a rocky one. Mongolian “yokozuna” (grand champion) Harumafuji apologised last week after media reported he had pounded junior wrestler Takanoiwa with his bare fists and a beer bottle while drinking at a restaurant-bar with other wrestlers last month. The 33-year-old Harumafuji was angered when he noticed the younger wrestler checking his smart phone while he was being chastised for having a bad attitude, the reports said. Conflicting reports have emerged about what took place and how serious Takanoiwa’s injuries were. However, he is not taking part in an ongoing tournament due to a fracture, concussion and other injuries, according to the Japan Sumo Association (JSA). A JSA official told reporters on Sunday that Harumafuji had admitted hitting the 27-year-old Takanoiwa but it remained “still uncertain” whether he had used a beer bottle in the assault. The affair has grabbed headlines and upset fans, some of whom had been lured back to the sport after the promotion of Japan-born Kisenosato to the highest rank in January. Kisenosato became the first home-grown grand champion in 19 years, during which sumo had trouble attracting native sons to an arena dominated by foreign-born wrestlers. “As a sumo fan, I am so sad and also feel scared. So many things seem to be covered up,” said Kazunari Maguchi, 48, a bar owner who travelled from Tokyo last Sunday to see the 15-day tournament in Fukuoka, southern Japan. Fans packed the convention centre where the bouts are being held through to Sunday, while TV cameras jostled outside trying to catch key players in the saga. Police are also investigating the incident after former grand champion Takanohana, who is Takanoiwa’s “oyakata” (the wrestler’s coach and stable master), filed a complaint. Takanohana, a JSA director, has advocated reforms of a sport in which only senior wrestlers have monthly salaries, can marry and live outside “stables”, and where juniors are subjected to tough communal living conditions. But he has also come under fire for an apparent delay in informing JSA officials about last month’s punch-up. The origins of sumo, in which giant wrestlers clad in loin-cloths seek to topple or push their opponents out of the ring, stretch back centuries and its traditions have links to Japan’s Shinto religion. The sport has struggled with violence before. 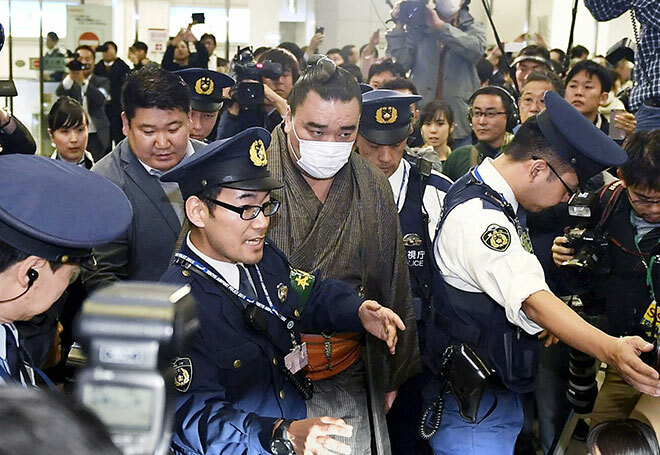 A former oyakata was sentenced to five years in prison in 2010 after a court found he had ordered wrestlers three years earlier to beat 17-year-old trainee Takashi Saito, who had tried to run away from the gym. Saito died from his injuries. Mongolian yokozuna Asashoryu quit the sport that same year after a probe into reports of a drunken scuffle in Tokyo.